A Bupa carer was caught on a family’s spy cam verbally abusing a dementia patient before twice spraying an aerosol in her MOUTH, a court heard. She can be seen telling the elderly widow that having Impulse body spray in her mouth was “better than poo” before ordering her to “wash your mouth” with a flannel. 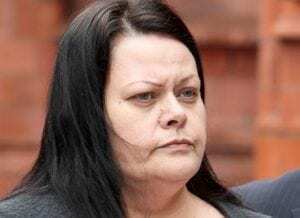 Birmingham Magistrates Court saw secret footage of Susan Draper, 43 – who had worked at Perry Locks Care Home in Birmingham for 17 years – entering Mrs Boylan’s room on September 14 last year. Betty Boylan’s relatives hid the device inside a television after they found unexplained bruising on the retired nurse when they visited her at the £1,000-a-month care home. Within days they uncovered disturbing footage of carer Bina Begum, 49, lifting the great-gran by her head before throwing her back into her chair. The force of Begum’s attack was so hard Betty’s chair was seen to rock backwards before her head slumped to the side. On another occasion, Draper was caught on film spraying deodorant in Betty’s face and joking it is “better than poo” when a colleague said it went in her mouth. Betty’s relatives went to the police after recording the footage at the Bupa-run Perry Locks Care Home in Birmingham in September last year. Begum, of Perry Bar, Birmingham, was arrested and admitted ill-treating and neglecting Betty. The former auxiliary nurse was handed a 12-month community order with 40 hours of unpaid work and fined £270. In February. Susan Draper denied ill treatment of Betty Boylan, 78, but was convicted on Monday July 10 after the video evidence was played in court. Prosecutor Shawn Williams said: “Betty Boylan has dementia and is immobile. “The court will see on a number of occasions some CCTV footage of the conduct of ill treatment. Her family have been diligently caring for her but they put her there for a short holiday – she suffered from dementia. “She is one of the most vulnerable people – she is immobile and incontinent. “Her family had to decide she would remain in the nursing home they continued to visit three times per day – although Betty could not hold a conversation, she responded well to external stimuli and is a happy individual who was placid, peaceful and compliant – which is supported by her care notices. “In August of last year, safeguarding was required after apparent bruising of Betty – but it is not suggested she had been hit or anything of that nature. WARNING: UPSETTING VIDEOA Bupa carer was convicted today after she was caught on a family's spy cam verbally abusing a widow with dementia before twice spraying an aerosol in her MOUTH.She can be seen telling the elderly widow that having Impulse body spray in her mouth was "better than poo" before ordering her to "wash your mouth" with a flannel.Birmingham Magistrates Court saw secret footage of Susan Draper, 43 – who had worked at Perry Locks Care Home in Birmingham for 17 years – entering Betty Boylan's room on September 14 last year on a spy cam Betty’s family set up in her TV.Court report follows. Referring to the seven-minute film which was shown in court, Mr Williams added: “The defendant calls the complainant ‘Betty Boo Boo’ and the court will consider if this is degrading. “The second carer entered the room and returns with a hoist and puts Betty into her chair. That was a wrong procedure. There is some discussion between the two care workers if the body of the hoist was not going high enough. “If they dipped the bed it would have been sufficient. The harness is inappropriately attached. The lady’s bottom can be seen sticking out of the harness. Her bottom is in contact with the top part of the side of the bed which should have been lower. The carers then try to readjust her. It is not clear if they detached the part if they took Betty out. If it wasn’t it would have been uncomfortable. “She picks up an aerosol can, Impulse Body Spray – the family leave body spray because it is a nice thing for her to have, but it is not a nice thing to use simply to mask if she hasn’t been checked properly. “There appears to be no checking to see if there had been a bowel movement. “She starts to spray the contents of the aerosol can and sprays it about a foot away from the midriff up. “She is spraying in her face and the response from Betty is ‘stop it’. “Betty gurgles and coughs but she is not able to move out of the way herself. “She is not able to express herself in a way to register and say she wants it to stop. “The defendant says she did not do it deliberately, that she was simply doing something, going through the mechanics of her work having worked there for 17 years – but if that familiarity causes her to lower her professional approach, that comes within neglect. “The victim is heard to gurgle. “The second carer is under camera shot after putting on Betty’s shoes. “They continue with the victim’s personal care and she remains quiet and compliant. “The second carer says the spray has gone in her mouth – the defendant laughs and said: ‘It’s better than poo’. “This was an indication of a lack of care because she had not been changed or even checked. “It is something which a carer acting professionally and responsibly should have avoided -this is an experienced carer. “The defendant starts to wipe Betty’s face with a flannel. “She gurgles because it is unpleasant. “She says ‘Wash your mouth’. “She then says ‘hold your baby (doll)’, and then starts to wheel her out of the room and stops – she may be brushing her hair again. “A disciplinary followed and the defendant was sacked – she was interviewed about the matter on January 31 and she became very upset. “She confirmed she is the person in the footage. “She said she tried to move the side of the bed but it was stuck, so Betty was hoisted slightly higher than normal. “The body spray was used to make Betty smell nice. “She said she was about an arm’s length but then said she was about 12 inches away. “She said she wouldn’t harm Betty and ‘I love my job’. “She said she had made a mistake and she had never been specifically shown how to use the body spray. “Those that care for the elderly or those unable to look after themselves, have a high degree of trust. “In this case, care fell well below that. “There is a cumulative effect: how the victim is being spoken to, the way she was taken out of her bed and not checked if she had been incontinent and the spraying. Draper was fired from the care home after the incident and Betty Moylan now lives with her daughter. Draper told the court: “I just wanted her to smell and look nice and presentable. I did not hurt Betty, I love her so much. Vivienne Birch, Director of Quality for Bupa Care Services, said: “This behaviour is totally unacceptable. We immediately suspended both Draper and Begum in September 2016 and shortly afterwards they were formally dismissed. We were shocked and saddened by the footage. Draper will be sentenced on July 24. The maximum sentence she faces is five years in jail.